If you don’t think football is big in Bryson City and Swain County, you should have seen the turnout for Thursday’s Pep Rally and Parade. Despite the drizzle, Everett Street was lined with enthusiastic fans cheering for their home town heroes. 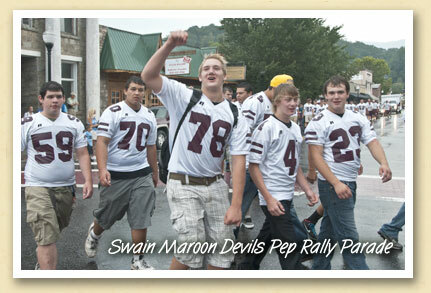 Favored to win the tough Smoky Mountain Conference, the Swain Maroon Devils began their season with 21–14 win at East Henderson Friday night. This week, they’ll face Smoky Mountain High for the first home game of the year. Want to attend a Maroon Devils home game? Kickoff is at 7:30 pm. Tickets are $5. The stadium is on Fontana Road, just north of town.